Angela Flo Llinas a.k.a Gelika/ Insane Creatures/ Tyndra) born in Barcelona in 1987, had her first connection with music through the violin when she was 10 years old, later on at the age of 12 she started listening to electronic music and after a few years she came across Psychedelic Trance music and straight away loved the sound of it. In 2005 she started djing Psytrance and then she moved to the United Kingdom (London) and started to play in the London Psytrance scene. In 2008 she decided to go deeper and started to study Music production at the London School of Sound and a Music Technology Specialist BA (Hons) in the University of West London. Angela now have a number of releases in different labels around the globe since 2009. Her first EP ‘’Fractal Dreams’’ was in 2011 at Green Wizard Records, her second EP “Complex Behaviour” in 2014 at Purple Hexagon Records; were she also compiled the V.A. 's Quantum Animism 1.0 and 2.0 under the name of Gelika, and now she has released her first ever full album ‘’Underwater Mysteries” with her Insane Creatures project. Angela also has a faster side project under the name of Tyndra, along with her mastering and recording skills (Gelika Mastering Studios). In 2016 she opened her own record label along with her friend Ivanelic were they compiled the V.A. 'Epiphysis Cerebri' and now she is working on her first Tyndra album to be out at Catar Records, the second Insane Creatures album and on a number of extra single releases around the globe. 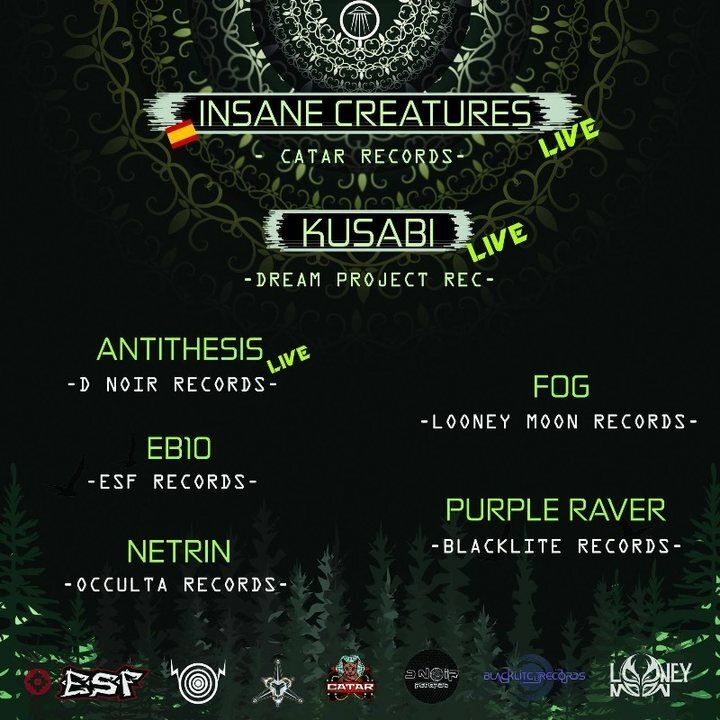 Kusabi is a psytrance producer born in Trieste in the North East of Italy in 1989. He is studying both classical and electronic music, plays the electric bass for different bands, blues, rock, punk and metal, taking part in several tours around Europe and USA. He is suddenly fascinated by psy trance after discovering it and he soon decides to undertake the production of this sort of music, of such expressive freedom. Thus his style takes shape from the varied musical background which he has experimented and this is characterized by a quick aggressive rhythm,deep embracing atmospheres always accompanied by organic and cybernetic sounds. In the summer of 2017 Kusabi released his first ep: ''New Connections'' on Dream Project Records. Dopo 3 edizioni spettacolari di Forest Lab, torniamo per proporre la quarta edizione di uno dei party che più di tutti va a toccare le sonorità Forest/Dark della musica che tutti amiamo, stiamo parlando di FOREST LAB 4.0! Per questo party abbiamo pensato di non farci di nuovo mancare nulla, la line up sarà composta da 3 Live potenti e di qualità che non vedono l'ora di far saltare il Mothership, più alcuni dei dj che hanno infuocato le psy night torinesi e non solo.